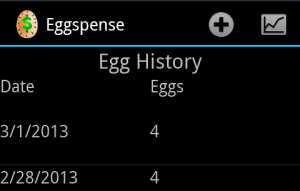 Eggspense, my latest Android app, allows chicken keepers to track their chicken related expenses. The app helps someone with a flock of layers determine how much it costs to produce one dozen eggs. 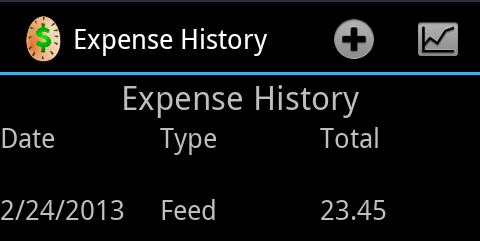 It does this by tracking chicken expenses and egg collections. All chicken expenses can be entered and logged by the app. See below for a screen shot. Track all your chicken expenses. Collecting eggs is a daily chore and the app makes it easy to log how many eggs were collected each day. Once the data is collected relevant statistics can be calculated. The app automatically recalculates the cost per dozen eggs every time the statistics screen is entered. 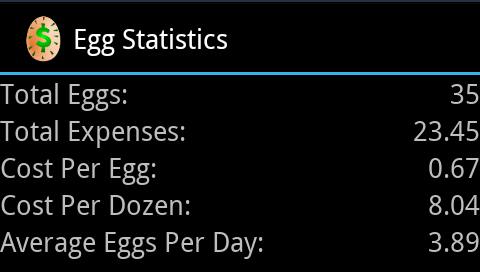 Let the app calculate how much it costs to produce a dozen eggs. This app uses an SQL Lite database. It also integrates with AChartEngine and ActionBarSherlock.